What Makes a Cat's Eyes Glow? Your cat's glowing eyes let her see better in the dark. 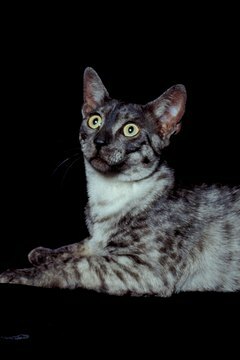 The startling shine of your cat's eyes peering out of the dark may seem like a neat trick your feline is playing on you, but the glow is really just an eerie aspect of her feline biology. Your cat has an anatomical feature in her eyes that people don't. Your cat's eyes have a thin layer of reflective cells just behind the retina, the area at the back of the eyeball that gathers up light. Many other animals, including dogs, deer, and horses, also have a tapetum lucidum in each eye, but this feature is particularly reflective in the eyes of cats. The reason your cat has a tapetum lucidum in each eye has to do with the fact that he's a creature of the night. This structure helps improve his night vision by reflecting the low light back into the light-collecting area of the eye, giving your cat's eye a second chance to collect it and send the visual signal to the brain. This makes your cat's eyes about six times more sensitive to light than yours are, which explains why he can weave his way through a dark room without knocking anything over even when you can't see a thing. You'll notice your cat's glowing eyes when the lights are dim, but they won't shine if the room is pitch black. This is because the tapeta lucidum need at least a little light to reflect or they can't do their job. Most cats' eyes glow green, but some shine a different color. Owners of Siamese cats sometimes notice that their pets' eyes shine yellow instead, and Siamese cats with a specific genetic mutation sometimes have eyes that don't glow as bright as other cats' eyes. Even two cats of the same breed can end up with a slightly different color glow if their eyes have different levels of pigmentation. Normally, your cat's tapeta lucidum stay well-protected behind the retinas, so you don't need to worry about them too much. However, a deficiency of taurine, an amino acid found in meat and fish, can lead to a breakdown of the tapeta lucidum. Most commercial cat foods contain enough taurine to prevent this kind of deficiency, but if you prepare your cat's food at home, you may need to consult with a veterinarian to make sure you're including the right amount of taurine to maintain your cat's eye health. NPR: Why do Animals' Eyes Glow In the Dark? How Long is an Exotic Persian Cat's Fur?